Paul Motian was born in Philadelphia in 1931 and from the age of two, he grew up in Providence, Rhode Island. His first musical attraction was the guitar. As he explains to Downbeat "because I liked cowboy movies - the guy puts his guitar around his neck, strums, sings - that looks like fun, I thought, 'I want to do that'". But his musical interests switched to the drums: he soon graviated to a neighbourhood drummer by the age of 12 he was taking his first lessons. Around this time Motian met Bill Evans. They played together in Tony Scott's group. Soon Paul had extended work with Lennie Tristano. He also recorded with George Russell and had opportunities to play with masters as Sonny Rollins and John Coltrane. The now legendary Bill Evans trio with Scott LaFaro (1959/64) broke new ground in terms of how the group members shared musical functions - blurring the distinctions between soloist and accompainists; heightening the standards for group interplay in the process. It has proven to be one of the most pervasively influential groups in Modern Jazz history. Throughout the 50's and 60's, Paul frequently worked with group leaders like Coleman Hawkins, Oscar Pettiford, Charles Lloyd, Pharoah Sanders, Mose Allison and folk-singer Arlo Guthrie (at Woodstock). In fact Paul sometimes regrets today that he turned down the opportunity to become the second drummer in Coltrane's group - the seat that was eventually taken by Rashied Ali. The 60's found Motian along with other drum innovators like Elvin Jones, Tony Williams, Blackwell, Billy Higgins and Roy Haynes developing an approach to jazz drumming that captured the pulse of the music - providing meter without the explicit repetition of earlier styles. Motian mastered the nuances of color, texture and melody that take the function of the drums well beyond that of time and propulsion of the group into the more challenging realms of composition and utilizing space. In the late sixties, Motian began playing with Keith Jarrett aside of Charlie Haden. After several years as a trio, Dewey Redman joined the group. This quartet has also endured as one of the major musical forces of its time. The quartet broke up in 1976, but in the ensuing years, Paul has continued to work with bassist Charlie Haden in a number of musical settings. 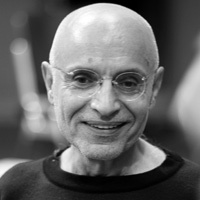 Throughtout the 70's and 80's, Motian's status as group leader, composer and recording artist grew and matured. His first two records as a leader, Conception Vessel and Tribute (both on ECM) featured such friends and musical associates as Jarrett, Haden, Leroy Jankins, Sam Brown and Carlos Ward. By 1980, Paul was eager to move on. "I wanted guitars", he said. Pat Metheny reccomended Bill Frisell. Ed Schuller (bass), Joe Lovano and Billy Drewes (saxophones) rounded the newly formed quintet up. With the expanded format Motian's music became more colorful and complex. Paul, occasionally still performing with this group, began concentrating on the distilled trio edition with Frisell and Lovano. Biography courtesy of jMT Productions, München D.